At last night’s Moncler Genius bash in Milan, the buzziest designers of the moment unveiled their takes on the classic down jacket. If there is still cold weather to be insulated from, the next generation of competitive outerwear purchasers could very well remember the late-20-teens as the moment when the down jacket made a play for everyone’s entire closet. And last night in Milan, Moncler laid out the blueprint for how it’s going to go, uh, down with a massive ten-pronged show to unveil the third season of Moncler Genius, the Franco-Italian alpine brand’s innovative collaboration-heavy platform. Now in its third season, Moncler Genius is ambitious even by the standards of today’s endless parade of partnerships. But the concept remains simple: a group of designers, chosen by Moncler CEO Remo Ruffini, are given free reign in the Moncler design studio to create their own collections. The product is then released in a series of drops, streetwear-style. The designers most hell-bent on proving that sentiment were Williams and Green, two of fashion and hip-hop’s favorite new designers. Both have a knack for product innovation and a shared fluency in hype, and at the unveiling they explored just how far the horizon of tech-y sportswear extends. 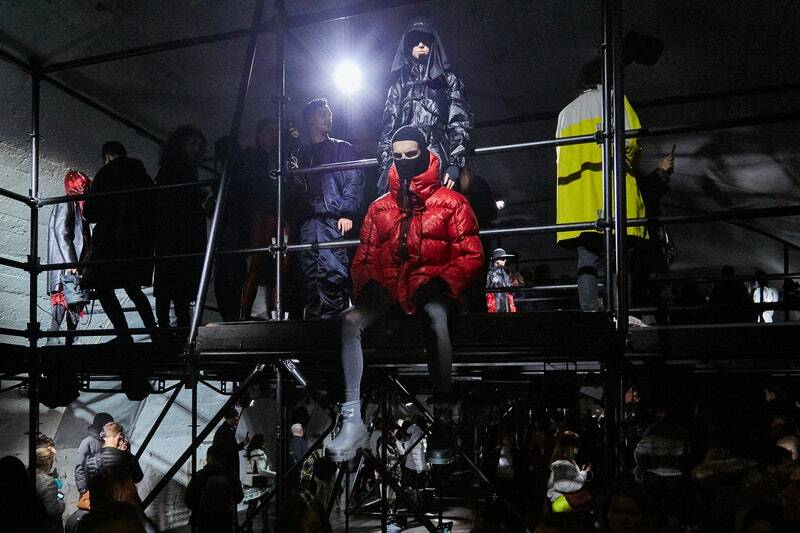 Disrupting the runway show is, of course, part of the Moncler Genius mandate, so last night the Milan Fashion Week circus descended upon a network of long-abandoned tunnels abutting the Milano Centrale train station. There was copious prosecco, dalmatians and daschunds in Moncler jackets (part of the brand’s adorable Poldo Dog Couture program), untold numbers of highly chic Italian fashion influencers, and more smoke (via fog machine) than outside Giacomo Bistrot on a Friday night. This was the “Moncler Genius Building,” Moncler’s most visible effort to establish a deeper connection with—and fulfill the multi-faceted fashion needs of—a public that is well familiar with its tri-color-logoed down puffers. As Ruffini put it in an email after the show: “Moncler Genius is conceived as a global statement talking to all customers creating a community that is based on shared values, quick and emotional interactions and unique shopping experience through all touchpoints.” To that end, the Moncler Genius Building will throw open its doors to the public on February 24; the brand expects 10,000 people to attend on the first day. There was plenty of down, too, which in Williams’ hands was made into oversized parkas and slim-fitting chest harnesses. Williams also developed Moncler’s very first garment-dyed down jacket, accessorized by custom versions of Alyx’s signature buckle clasp. If Williams’s red-hot Nike collaboration is any indication, his Moncler gear will swiftly sell out when it drops starting in August—but the success of the partnership really lies in the fact that it looks like a fantastic Alyx collection recreated out of Moncler nylon and goose feathers. Expect to see some of the tricks Williams has picked up at Moncler to filter back to his white-hot mainline. “This project is really about collaboration,” Williams emphasized.